Paul Barden Roses: Inheriting doubleness. Looking at the AgCan breeder L83 you would never guess it would be capable of producing double offspring. And yet, it frequently does. Many of my selections from three crosses made in '07 are at least semi-double (15 petals or more) and some are intensely double. 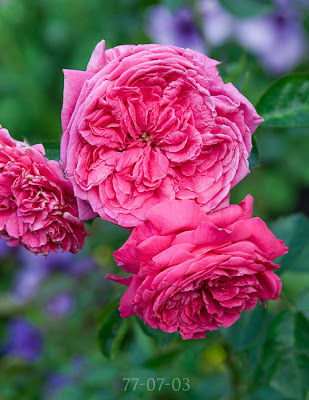 Take this seedling 77-07-03 for example; double in the style of many of the Old Garden Roses displaying "quartered" blooms, packed full of petals arranged in a swirl. This seedling also happens to be a pretty good repeater (compared to its somewhat reluctant siblings), grows with abandon and yet is maintaining a shapely, restrained architecture. So far it has shown complete immunity to all diseases. If that continues to be the case, then this selection may have a future in commerce. If it has Winter hardiness, as many L83 seedlings do, then even better! FYI, as the tedium of my routine settles in, what with all the weeding and watering and dull chores to do, I am posting less and less often these days. I need a vacation, to be honest, and yet I have to maintain things. So, don't expect a lot of detailed blog posts in the next month or so; I'm just not enthused about adding yet another task to my to-do list at the moment! That is a gorgeous rose that would be most welcome in my garden. Sweet. What is your general strategy for obtaining quartered blooms, if you have one? I used pollen of Golden Celebration this summer which has the heavy petal count but not quite the fully quartered form.